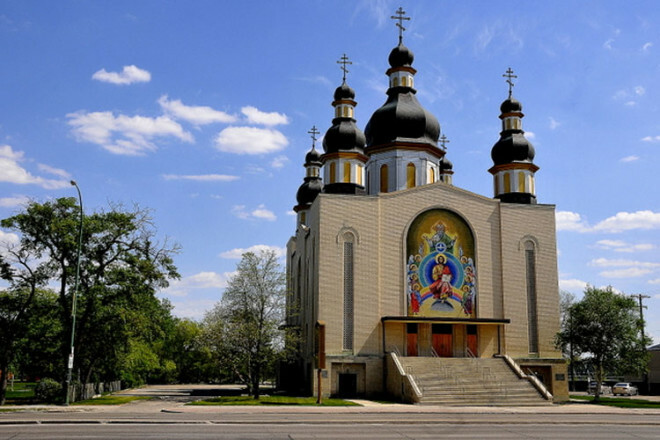 The Holy Trinity Cathedral has been a prominent structure on the Winnipeg architectural landscape since it was completed in 1962. It was built in the style of traditional Ukrainian Orthodox Cathedrals in Ukraine, with five copper domes and a Byzantine Iconostas. The large mosaic of the Trinity at the front of the building was designed by Leo Mol. Inside, stained glass windows feature Ukrainian Canadian religious themes. A museum on the main floor showcases the rich traditions and culture that Ukrainian immigrants brought with them to Canada.